Understanding how to grade a sports card can be an invaluable tool for both new collectors and grizzled veterans of the hobby. While most turn to third party card grading services (such as PSA and SGC), knowing what a raw card will earn for a grade is important for collectors. In this piece, we discuss some of the pros and cons of the third party grading companies, while offering collectors a lesson on professional grading. We hope this resource will provide everything you need to view cards just as the professionals do. This knowledge will help when spotting raw cards for sale and allowing you to come up with an expected grade on the spot. The grades for cards are as follows, from best to worst. Note that this is a generic classification system that is standard throughout the industry. As we will explore in later sections, the third party grading companies have their own guidelines, but the actual grades are consistent across the grading companies. Also, it’s important to note that the age of cards makes no difference in card grading! A 1909 T206 card that is graded as Mint is held up to the same standards as a 2018 Topps card. It’s a common misconception, but Mint is Mint and Poor is Poor, no matter the age of the card. Centering is one of the key inputs to evaluating a card’s grade. For some collectors, a card with near perfect centering is an absolute necessity, while some are willing to overlook centering in hopes of a card with pristine corners and little surface wear. Whatever the case, centering is an important part of the grading process. One can typically eyeball a cards’s overall centering. It might be hard sometimes to tell if a card has perfect 50/50 centering, but it’s fairly easy to tell is something is quite off-center. Centering is actually a mathematical process, and the professional graders are actually measuring the distance of the outside border to the edge of the card on the top and bottom and left and right. If the distance is exactly the same for all four measurements, a card is considered to have perfect centering. Here’s a great little spreadsheet that someone from the Collector’s Universe built to help in calculating the actual centering percentages. It’s somewhat simple: measure the top and bottom borders in your preferred unit (mm, inches, whatever), add the two and then divide the top border measurement by the sum. So here’s a Jordan Rookie with some clear centering issues (it actually received a Mint (9) rating from PSA but with an OC or off-center qualifier). According to PSA, a card that gets a Mint (9) rating from them has to have centering of 60/40 to 65/35 on the front. If we measure the left and right borders, we find that this Jordan card actually has 70/30 centering. So, even though it met all of the requirements of a Mint card, it’s centering led it to receive a 9 (Mint) grade with an OC (or off-center) qualifier. Note that the different grading companies have slightly different standards for centering. PSA is slightly more lenient versus SGC. A card that is considered “Gem Mint” must have four perfectly sharp corners and is a general standard across the grading companies. What you and I think might be perfect corners, might not cut the grade with PSA or SGC, as the graders are looking at the card under magnification in order to get a close look at the card. Any slight imperfection on one corner will move you down the grading scale, while multiple corner issues will move you even further down the scale. Cards that are graded Fair or Poor typically have severely rounded corners. Most collector’s don’t normally think of a cards surface when considering a card’s grade, but this in an important factor. A perfect card with sharp corners yet with some fingerprints or dirt on the surface will never earn a Gem-Mint rating. As we discuss later, using a jewelers loupe and/or a blacklight can also help get your eyes on some other unidentifiable surface issues that your naked eye can’t pickup. Surface problems can come in all kinds of forms, but some of the more common issues that will downgrade a card’s grade are wax stains, print defects, focus imperfections, scratches, scuffing , and creases. Some surface issues might be potentially cleaned from the card, like dirt or fingerprints, while the others are unfortunately just something you’ll have to deal with. Lower graded cards will have these problems in increasing numbers and severity. As we also note later, PSA has its own ‘qualifiers’ such as ‘ST’ (or stain) that will be added on to a cards typical grade. The edges (or borders) of a card is also an important factor when considering a card’s overall grade. A card in Gem Mint or even Mint condition should have sharp edges with no signs of chipping. Sometimes it can be hard to see problems on a card’s borders with your naked eye, thus a loupe or other type of magnifying glass is needed in order to get a closer look at the card. Cards in lower grades typically have significant border wear with potentially chipped edges on the card. PSA is the largest and most highly respected card grader on the market. Many might argue the point, but cards that are graded by PSA tend to carry a better premium in the resale market versus other third party graders. Cards are graded on a 10 point scale from 1 through 10, with 10 (Gem-Mint) being the best. Cards that are graded as ‘Authentic’ are known to be genuine, but because of an alteration or other defect, the grader was unable to provide a numbered grade. PSA also has ‘qualifiers’ which can be added to a numbered grade—such as OC (off-center) or ST (stain). According to PSA, a “Qualifier” is a term used when “an item meets all of the criteria for a particular grade but may still have one significant flaw”. Qualifiers tend to bring a card down on average one to two grade levels in the resale market–for example a PSA 8 card with an OC qualifier would likely sell for what a PSA 6 or PSA 7 card would go for. Note that when submitting cards for grading, one can request a grade with ‘no-qualifiers’. One of the reasons for PSA’s market dominance, is the well documented population reports for graded cards, along with the impressive set registry, which allows collectors to submit and track their collections on PSA’s website. Costs for submission vary but starts at $20 for regular card grading. Due to popularity of card grading in recent years, turnaround times on submissions has been severely impacted. PSA is a division of Collector’s Universe (CLCT), a publicly traded company. PSA has been on a remarkable rise since 1991, a year which marked a tumultuous time in the grading company’s early years; allegations arose that it knowingly ignored an obvious trimmed 1909 T206 Honus Wagner card. Even ignoring that black mark on PSA’s history, I can assure you of one thing–the third party card graders are not always right! You can read an example of this in our lengthy piece on strip cards. If PSA is numero uno in the grading community, then SGC is a close second. SGC is popular with some vintage collectors who prefer the black inserts used in the SGC card holders. Still, PSA clearly has the edge as the hobby’s favorite and is the preferred company to use for maximizing resale value. As for quality, SGC has always been very consistent with their grading, maybe even with a better reputation versus PSA in this regard. But in the end, all of the grading companies are going to make mistakes; they are after all only humans. The days of Artificial Intelligence and algorithmic grading aren’t here (YET) so we have to live with the flaws that human grading brings to the table. There will always be cards that appear under or over graded, and in the former, most just chalk it up to the grader having a bad day. I WISH that there was more uniformity among third party graders, but until those bots start grading cards, it is what it is. The grading industry is long overdue for a major overhaul. I hope that whatever technology will be used corrects some or all of the current problems. I really don’t want to hear about the subjectivity of grading. I want to hear about a system that grades cards correctly and will deliver that same grade no matter how many times a card is reviewed. I don’t want to hear stories about cards being submitted three times and getting three different grades. If it can’t be done right, then it shouldn’t be done at all. BIG NOTE that SGC has recently moved to a new grading system! From herein on in, they are only utilizing the 0 to 10 grading system that PSA uses. 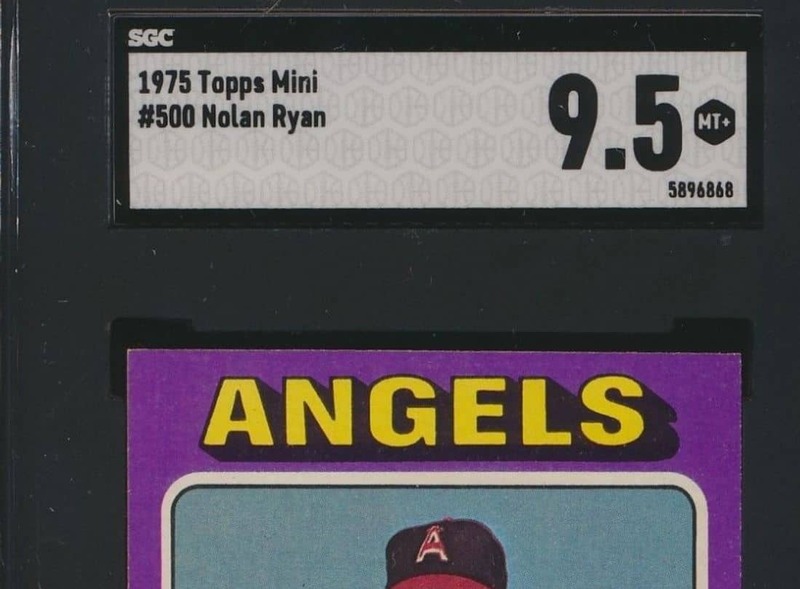 Previously they used to include their 0 to 100 grade and the equivalent PSA 0 to 10 grade (see Ripken rookie card above for an example of this). Now it will only be a 0 to 10 rating. In addition, they went from their custom forest green color to new black bold lettering (see 75 Topps Ryan below). I can tell you that personally I don’t like it, and most in the hobby don’t either. I think the numbering grade change is a good one, but the color change just completely changes their identity. Note that SGC is also introducing a new scanned registry which could be a game changer, but it all comes down to execution and I worry about SGC’s ability to do this effectively. I haven’t used Beckett as much as I have SGC and PSA, but in my experience the grading consistency is quite good. The problem being that PSA and SGC tend to be more widely utilized with vintage cards, thus leading Beckett to be more of a lower tier grader in the vintage collecting world. In addition, Beckett itself has three different grading subsidiaries: Beckett Grading Services (BGS) for cards from 1981 to present, Beckett Vintage Grading (BVG) for pre 1981 cards, and then Beckett Collectors Club Grading (BCCG) which is a lower tier grading level that Beckett uses and is generally not well regarded. For vintage collectors, I wouldn’t really bother with any of the Beckett grading services. I know some that use BVG for vintage card grading, but typically PSA or SGC will generate better returns. In addition, I know someone who just waited over a year to receive some card submissions back from Beckett. No thanks. According to PSA, in order to earn a pristine PSA 10 (or Gem-Mint) rating, the card must be a ‘virtually perfect card’. The corners must be sharp, with no staining and original focus in tact. Note that PSA does allow cards that are slightly off-center to earn a PSA 10 grade, but not to exceed 55/45 to 60/40 in the front or 75/25 on the reverse. Below, is a PSA 10 graded Ken Griffey Jr 1989 Upper Deck rookie card. You can see that the corners are pristine and the card overall is in remarkable condition. An equivalent grade of PSA 10 (or Gem Mint) for SGC would be SGC 98. Note that a SGC 100 is what they refer to as ‘PRISTINE’ and does not allow for any off centering. Thus a PSA 10 could technically crossover to an SGC 100 and vice versa. Confusing, right? According to PSA, a grade of PSA 9 (or Mint) would be a superb condition card with one minor flaw, either a slight wax stain on the back of the card, a minor printing imperfection or an slightly off white borders. Overall centering on a PSA 9 still needs to be within guidelines of 60/40 or 65/35 and 90/10 on the reverse. As shown with the 1985 Donruss Clemens rookie below, the card looks fantastic, but there are a few minor border imperfections, which result in the card only earning a 9 grade. SGC’s guidelines refer to a Mint card as a score of SGC 96 and has most of the same sort of guidelines as PSA. According to PSA, a grade of PSA 8 (Near Mint-Mint) is still a superb card at first appearance but after examination has a slight wax stain, slight wearing on corners, a minor printing imperfection or off white borders. Centering has to be 65/35 to 70/30 on the front and 90/10 or better on reverse. SGC’s guidelines refer to a Near Mint to Mint card as a score of SGC 88 and has most of the same sort of guidelines as PSA although slightly less lenient on centering, noting that 65/35 centering or better is required. We have below a quite nice looking George Brett 1975 Topps Rookie card graded a PSA 8. The corners look pretty nice, but you can see some slight wear on the bottom right corner, along with a small red print defect on the bottom right corner, along with another small print defect next to the S in ‘Royals’. This one was probably close to getting a qualifier (PD or print defect) but overall still a good looking Brett rookie card. According to PSA, a grade of PSA 7 (Near Mint) is still a very nice card on appearance, but there is some slight surface wear or fraying on the corners. Minor printing blemishses and wax stains are acceptable, although anything more significant would likely result in a qualifier. Centering guidelines are slightly loosened here as 70/30 or 75/25 on the front is OK. Thus, you might see some very off-center PSA 7 cards without any qualifiers. SGC’s guidelines refer to a Near Mint card as a score of SGC 84 and has most of the same sort of guidelines as PSA although slightly less lenient on centering, noting that 70/30 centering or better is required. We have below a 1954 Red Heart Mickey Mantle card, graded a 7 by PSA. We can see that the overall condition of the card is quite good, although the most notable flaw is the centering itself. Again, this would fit in with PSA’s criteria for centering, but is not exactly something with great eye appeal. Don’t get me wrong, still a fantastic card, but this one might not get the same premium as a PSA 7 with perfect centering. According to PSA, a grade of PSA 6 (Excellent-Mint) means that a card has minor wear on the corners, 80/20 or better centering, and no major flaws. SGC’s guidelines refer to a Excellent-Mint card as a score of SGC 80 and has most of the same sort of guidelines as PSA although slightly less lenient on centering, noting that 75/25 centering or better is required. We have below a 1969 Topps Reggie Jackson Rookie card graded a PSA 6. Card is in overall nice shape, but that top right corner is a bit soft, as also noticed on the flip sid of the card. Anything else wrong with the card would have likely led to this card earning a PSA 5 instead. According to PSA, a grade of PSA 5 (Excellent) is still an attractive card, bu may have light rounding of the corners, very light creasing, minor wear on the surface, and centering of no worse than 85/15. Below is a 1909 T206 Rebel Oakes card graded a PSA 5. For a nearly 120 year old card, it’s obviously in pretty nice shape, but we can see some wear on all of the corners. I think this might have actually been a generous grade (note that does happen a lot) but still, we can see the much lower condition from higher graded examples. According to PSA, a grade of PSA 4 (Very Good – Excellent) means that a card’s corners may be slightly rounded. Surface wear is also noticeable but modest. May have light scuffing or light scratches. Some original gloss will be retained. Borders may be slightly off-white. A light crease may be visible. Centering must be 85/15 or better on the front and 90/10 or better on the back. SGC’s equivalent for a PSA 4 is an SGC 50, with criteria mostly the same, although SGC notes centering must be 85/15 or better. Below is a PSA 4 card of the GREAT ONE, 1979-1980 Topps Rookie Card. There is certainly some corner and border wear and those corners are lot more rounded than any of the higher grade cards we’ve examined so far. Other than that, the card overall is in pretty decent shape. According to PSA, a grade of PSA 3 (Very Good or VG) has noticeably rounded corners (albeit not extreme), with printing defects, light creases, or small wax stains possible. Surface wear and edge wear is also common. Centering must be 90/10 or better. SGC’s rating is a 40 for a Very Good card. Guidelines are similar to PSA and also notes that stronger creasing may exist. Here’s a great card — the 1954 Bowman Ted Williams as graded a 3 by PSA. The card has some obvious corner wear and some light creasing near the top left corner of the card. Can also see from the back of the card that there is some obvious crackling due to aging of the card which would also bring down the grade. According to PSA, a grade of PSA 2 (Good) indicates a card with obvious defects, normally significant corner and/or surface wear. Creasing is very possible, along with staining, scratching or cuffing. Centering must be 90/10 or better. SGC’s guidelines refer to a Good card with a score of SGC 30. Here’s a PSA 2 graded 1952 Topps Willie Mays. We can see the rounded corners and noticeable surface wear on the front of the card along with some discoloration from age. There is also a minor crease that can be seen running from the left middle side to the center of the card. A grade of PSA 1.5 (Fair) is a card with extreme wear, likely rounded corners, can be scuffing, staining2, with one or more heavy cases. A Fair card is in pretty rough shape, but still intact. If there are missing pieces of the card it can’t receive a Fair rating and would likely receive a Poor (or PSA 1 grade). **Note that PSA changed their grading system to add half point grades back in 2015, thus you might see older cards with a “PR-Fair 1” which would grade as a PSA 1.5 today. According to SGC, an equivalent grade is an SGC 20 and has the same general guidelines as PSA. Here’s a Michael Jordan ’86 Fleer rookie card as graded PSA 1.5 (Fair). We can see that the card has some obvious wear, with rounded corners, chipped edging, some creasing along the left edges and some discoloration on the back top and sides of the card–see that yellowing? A PSA 1 (or Poor) graded card has many of the same qualities as PSA 1.5 (Fair) card –such as heavily rounded corners, discoloration, staining, heavy surface wear, creasing etc, but the wear is much more significant in nature and as PSA notes ‘the card has almost vanished in entirety’. So, i’ve heard someone say ‘imagine if they rolled up the card in a ball–you have a PSA Poor’. SGC’s equivalent rating for Poor is SGC 10. Here’s a 1949 Leaf Babe Ruth (i love this card) which from a corner perspective has wear, but not terrible. It’s that missing part of the front of the card to the left of Babe’s hat and the roughness at the bottom near his name. Then we look on the back and whoa, it’s a big mess, some sort of coffee or drink stain it looks like, but whatever the case it’s definitely in bad shape. Each company has their own requests for submitting cards to be graded. I highly suggest reading all of the guidelines before submitting to each respective grader. We will provide some more tips and advice on this at a later date. First, you don’t NEED this, as I noted previously, you can just measure the borders and use this spreadsheet to help calculate the percentages. But I have heard good things about this Grademaster tool so it seems really helpful and thought I would give it a plug here. I’ve also heard of some people that use a sewer’s Omnigrid, which is basically a plastic measuring grid. So either one is totally not necessary, as as ruler might be everything you need. I bought one of these from eBay and its just like what jewelers use and its only $5–it has an LED light and magnifies things up to 60x their size. Good thing is that it’s portable, so if you’re going to a store or your local card show you can bring it along for the ride. Surfaces are one of the key inputs to evaluating a card grade, so if the surface of the card is dirty or has fingerprints, it will receive a lower grade. Carefully wiping the card clean with a microfiber cloth such as these can help avoid an unnecessary low grade due to a dirty surface. Note that I also really liked this discussion on the Beckett forum about doing your own card grading. They also discuss getting a blacklight, which can be very helpful in looking at surface issues along with helping identify if you might have a reprint/fake card on your hands. I don’t own a blacklight (yet) but have my eyes on one, as I’ve run across a bunch of reprints that would be much easier to identify with a blacklight.